Have a question about the MedPack or one of our other services? Contact us today! Simplify your medication management, sign up for the MedPack today! MedPack is a personalized medication packaging system that organizes patients medications into individual pouches labeled with medication name and time to be taken. MedPack is the solution for long term care facilities. MedPack is compliance based packaging system that will allow facilities to easily dispense medications in less time. Download these helpful PDFs to discover why the MedPack system is ideal for Specialty Care and Assisted & Community Living. 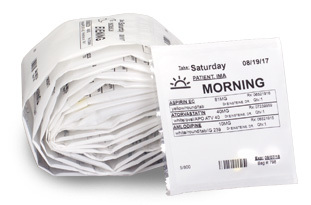 Do you have patients who would benefit from using our MedPack packaging system?